Last year, it seemed unfathomable that the Ottawa Senators would ever consider trading Erik Karlsson. Pierre Dorion was trying to build a Stanley Cup contender around Karlsson, and the general manager would openly gush about his star defenceman and captain. “They always say God rested on the seventh day, but I think on the eighth day he created Erik Karlsson,” Dorion famously said last spring. And yet, Senators fans now find Karlsson’s name at the top of TSN’s Trade Bait board with just five days until the trade deadline. Karlsson’s 12-month evolution from untouchable superstar to potential trade bait is one of the most fascinating tales in recent hockey history. - In late November, Karlsson told reporters in Brooklyn that he was not interested in taking a hometown discount when his contract expires in the summer of 2019. “When I go to market, I’m going to get what I’m worth and it’s going to be no less – no matter where I’m going.” Karlsson made it clear that he was going to treat his contract negotiation in business terms. - Shortly thereafter, word started to circulate that the Senators had asked Karlsson to submit his no-trade list to the club. There was plenty of speculation as to when the request was made; was it in training camp or during the season? But the cold, hard truth is that at some point, the Senators did in fact ask for the 10 teams on his no-trade list. Owner Eugene Melnyk added another layer of intrigue to the situation when he told Postmedia that the request for Karlsson’s list came as a result of routine refinancing surrounding the club. No matter what the circumstances were, both parties confirmed the no-trade list was submitted. - In mid-January, Dorion left the door open slightly to a Karlsson trade at some point down the road, drawing a parallel to the fact that “even Wayne Gretzky got traded.” Dorion did clearly state that his top priority was to re-sign Karlsson, but he did admit to being open to listening to offers. These points viewed independent of each other are somewhat innocuous. But when you connect them all together, it paints a different picture. That’s not to suggest that Karlsson and the Senators have reached some sort of philosophical impasse. Karlsson’s comments seem to indicate he hasn’t been privy to the exact plan that has been laid out by Dorion and Melnyk. 1. Does Karlsson even want to stick around for a rebuild? 2. Is it possible to rebuild with a $10-million player on the roster? You have to take each side at face value when they publicly declare their intentions. 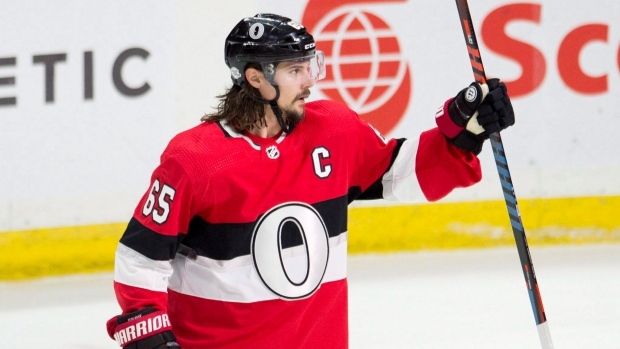 Karlsson has repeatedly said he would like to stay in Ottawa, while Dorion has stated on numerous occasions that would also be his ideal scenario as well. And yet here we are – days before the trade deadline – and the Karlsson rumours won’t go away. It’s been said on many occasions that the Senators are not actively shopping Karlsson, but they are listening. But in reality, that’s just semantics. No matter how you try and spin it, the bottom line is this: The Senators appear open to trading Karlsson if another team offered them a boatload of pieces in return. If they weren’t, this story would have been shut down weeks ago. Instead, this narrative seems to be gaining steam – rather than losing it. But the Senators need to tread cautiously because no matter how this plays out, they will not immediately win any trade involving Karlsson from a public relations standpoint. Tensions between the fan base and the organization are at an all-time high and moving the captain could ignite a powder keg of negative emotions in this marketplace. At best, the Senators would get back some valuable young pieces, but those players likely wouldn’t mature for another two or three years. Patience is in short supply in Ottawa these days. It’s hard to see a scenario in which the Senators execute a Karlsson trade and come out as winners in the short term. What the Senators can’t afford to do is make some sort of a rushed deal involving Karlsson in the next few days. They can’t get the type of return Boston got for Joe Thornton or Montreal received for Patrick Roy, in two other examples of superstar players being traded in the middle of the season. Even if they are trying to attach another heavy contract to the Karlsson deal – some have suggested Bobby Ryan – they cannot end up with an average return for Karlsson. This has to be a home run for Ottawa; not a ground-rule double. So Dorion has to enter the situation in the next few days from a position of strength. He has the best defenceman on the planet, a player who a few months ago was being mentioned in the same breath as Connor McDavid and Sidney Crosby. Karlsson is on a ridiculously cheap $6.5 million cap hit for the next season-and-a-half, making him one of the most attractive players in the league. And if another team wants Karlsson right now, they will be able to control him for at least two playoff runs. So that is why it makes total sense for the Senators to be actively listening on any offers for Karlsson over the next few days. If they were ever going to entertain the idea of trading him, it stands to reason that the best offers would come in now. While the field of Karlsson pursuers might expand in the summer time, the return would likely be watered down with only one guaranteed playoff run – unless the Karlsson camp was able to hammer out a contract extension with the new club. After the trade deadline, a lot of the power and leverage will start to shift towards Karlsson’s camp. With just over a year until unrestricted free agency, Karlsson will essentially have the ball in his court this summer. And if other general managers get a sense that Karlsson won’t be re-signing in Ottawa in 2019, the clock would start ticking on his time with the Senators. Whatever leverage Dorion had on the situation would slowly start to slip away. Again, everybody’s top priority appears to be trying to keep Karlsson in Ottawa for years to come. But if that scenario isn’t in the cards, it probably behooves the general manager to figure out what he could possibly fetch in return. So when it comes to Karlsson, can you really blame Dorion for at least listening when this might be his best opportunity to land a king’s ransom for his superstar?